Vegan oatmeal cookies are are one of my most requested treats. I hope you like them! They’re very easy to prepare and require only a mixing bowl and a spoon. If you read the comments, you’ll see many people have made little changes and improvisations, so to me that signals a good recipe. I hope you like Chewy Vegan Oatmeal Cookies. If you do, check out a few of the other vegan recipes I linked to below the photo. Thanks! Some of my other favorites are Vegan Spice Cake (an old one, but good), Vegan Chocolate Chip Cookies with Coconut Oil and Vegan Chocolate Cupcakes. I also love these Vegan Molasses Cookies. An easy vegan oatmeal cookie recipe. Try is with your favorite vegetable oil or coconut oil. Preheat oven to 350 degrees F. Line two cookie sheets with Silpats. Mix together the flour, baking soda, salt and cinnamon. Set aside. Mix both sugars, maple syrup, apple sauce, oil and vanilla together in a medium bowl. Add the flour mixture and stir until blended. Stir in the oats, followed by raisins. Drop by rounded teaspoonfuls onto the cookie sheets. Bake for 12-14 minutes. Let cool for about 5-8 minutes on cookie sheets then carefully scoop up onto a wire rack. Should the apple sauce be measured out before it’s drained or after? These oatmeal raisin cookies are amazing! You don’t have to be a vegan to love them. I made them for a fundraiser bake sale at work and they couldn’t get enough of them. They sold out before any of my other cookies. My father is not a vegan but he said they are now his favorite cookie so I make him a batch for every occasion and sometimes for no reason at all except to see that big smile on his face when I walk in with them. They are super easy and quick to make and delicious. I Love this recipe Thank you for sharing it with us. I’m happy to hear they’re working out for you, Karen! I need to make a batch today, but I’m out of pastry flour. My third time baking these. They’re in the oven right now, spreading gorgeously and smelling so sweet! I’m so stoked to see them spread, I can’t even wait to post a note!They’re for my co-workers tomorrow, lucky things 🙂 By the way, maybe the fact that this batch is spreading even better than my 2nd is because I followed the order of adding ingredients to the letter. Before, I just dumped everything in a bowl and mixed. It seems order matters! Glad you made it work, Karen! Baking involves so much chemistry. When I take liberties with baking, I always prepare myself for failure. Sometimes things work perfectly. Sometime they fail. After a while you get a knack for ratios and chemical reactions. If you get a chance, try the vegan chocolate chip cookies. They are one of my favorites. Thanks so much for your quick reply! I hardly ever bake cookies and I thought I could take liberties with the recipe! I just baked another batch and except for using white all-purpose flour (very light hand!) and 1/2 cup brown sugar that I grinded to finer texture first, I didn’t change anything. The cookies turned out great (moist and chewy… and sweet enough for me!) and look almost as nice as in your picture 🙂 Thanks for your help and for the awesome recipe. Hi Karen, you basically created a new recipe. Baking is a science, so every little change you make to the recipe will result in a different cookie. Most likely, cutting the sugar is what caused the lack of spread AND the lack of chewiness. I usually find that the more sugar, the more the cookies spread. And of course swapping out applesauce for oil creates a different texture as well. Changing the whole wheat flour to rice flour would also change the results. It’s always fun to experiment, but sometimes it’s best to try the recipe as written and THEN incorporate changes :). At least the cookies were tasty. That’s better than I can say for some of the experiments I’ve done in my life ;). I just baked these with a few changes, and the cookies came out looking like cereal bites (that is, they didn’t spread out at all) and are crunchier than chewy (just barely chewy at the centre). I put only 1/8 cup of oil and replaced the other 1/8 with applesauce; added 1/2 cup of sunflower seeds; used only 1/2 cup brown sugar but 1 whole cup of raisins. I also substituted 1/4 cup whole wheat all purpose flour with 1/4 cup brown rice flour. The cookies taste good but do not look like cookies, and I wish they were really chewy. Was it the lack of oil the problem, do you think? What makes cookies spread out? Wow! I am really impressed with these- just made them, they are hot out of the oven and they are SO delicious! Taste just like the real thing but no butter or margarine!! I’m so excited about that!! I’ve been craving that chewy soft oatmeal cookie sensation but was fearing they would come out too dry or crunchy- these are PERFECT!! These cookies turned out perfectly. They were extremely chewy, with a slight crisp on the edges. I ended up making 14 larger ones, which represented a traditional cookie better, and made sure to flatten them first (they puffed up during cooking). These were far better than my non-vegan attempts at oatmeal cookies, and I love how easy they are to make because no weird substitutes are required! Thank you so much! This will become a staple! Hi, I really want to try this but I won’t have time to do it after work tomorrow. Do you think the dough can stand the fridge so I can pop it in the oven and bake it really quick? Lisa, I haven’t ever tried it. Sounds like a fun experiment! I have never tried to make a vegan cheesecake, but that sounds like a fun project. If anyone has a good vegan cheesecake recipe, let me know. In the meantime I’ll do some research. Like some of the others who have posted on this site, I was purchasing vegan oatmeal cookies at Wholefoods (ouch!!). These cookies more than satisfy my oatmeal cookie craving. I have already made several batches. Got a good vegan cheesecake recipe? This recipe is a keeper! I never knew I needed a vegan oatmeal cookie recipe until I tried this one. I reduced the sugar slightly (left out the white sugar) and subbed a flax egg for the applesauce, and the cookies were still wonderfully sweet and chewy. I get the impression that this is a forgiving recipe, and it’s one that I will make again for sure. I made these cookies tonight and they are sooo delicious. I used regular pastry flour since I didn’t have whole wheat, I didn’t have brown sugar so just used granulated, and I didn’t have applesauce so I used egg replacer as one reviewer mentioned. The dough was a bit dry and when they were done they hadn’t spread out any. I am a fairly good cook/baker so I wasn’t sure what went wrong, but regardless they were fantastic! Crispy on the outside and chewy on the inside. Hands down they best vegan cookies I have had! Thanks for posting the recipe! I was craving oatmeal cookies but have been on a “no dairy” restriction. I was excited to see this simple recipe. The cookies turned out super chewy yet a tad crunchy and dense. I love them! Unfortunately I already ate 4 of them in one sitting. I think I might use less raisins next time to reduce the sugar/sweetness but will use this as my staple oatmeal cookie recipe in the future. YUM! They looked so beautiful that I wish I could have posted a photo. Man! I rarely leave reviews for recipes, but I had to make an exception for these cookies. Oatmeal cookies were the one thing I missed when I went vegan, but these are far better than the non-vegan one’s I’ve had. I had textured vegetable protein for some added protein (it didn’t change the taste at all). Spreading is often caused by too much sugar or not enough flour. What brand of pastry flour did you use? Maybe it was lighter and your 3/4 cup weighed less than other brands. I usually use Hodgson Mill. Making the cookies using weights is more accurate. Wish I could help you, but the recipe always works for me! Feel free to email me if you want to troubleshoot. My cookies spread so thin during baking they were see-through! 🙁 I made a second batch of dough, assuming I made a mistake & the same thing happened! After such great reviews I’m SO disappointed. Any idea what went wrong??? I have to add my 13 yr old daughter LOVED THESE COOKIES! She can’t wait to make her own batch. Thank you! Thank you for this recipe! I’m a breastfeeding mother with a newborn with allergies we have not been able to pin point. I made these cookies with gluten-free brown rice flour. I added 1/3 cup of 100% cocoa powder because I love chocolate and have not been able to have any in quite a while. I used quick certified gluten free cooking oats. I did not drain the applesauce. Instead of using 1/4 cup granulated sugar I used stevia. I soaked the 1 1/2 cups of oats in one cup of coconut milk for about 15 min. Once they were out of the oven I sprinkled them with powdered sugar. Let me just say OMG!!!! They were delicious!!! Thank you again! I needed a sweet treat to add to my new gluten, dairy, egg, nuts, soy free diet. I would suggest to anyone to substitute some fresh sliced strawberries for the raisins. I used just a bit more than 1/2 a cup and also had to cook the cookies just a bit longer due to the moisture of the strawberries but it was well worth it. The cookies still came out soft and chewy. I also opted to not use any oil and used double the applesause. I used blueberry applesause instead of regular. I blended 1/2 white pastry flour with 1/2 whole wheat all-purpose flour( I was low on the pastry flour). I am not a vegan but I was cooking for some vegan friends and I think I have found my new favorite cookie. My baby has a dairy sensitivity, so I’ve been looking for dairy-free dessert recipes. Made these today and they are delicious! I used regular white flour and the texture was perfect. I’ll definitely be making them again. I’m planning on making these as thank you gifts, but I was wondering how well this dough freezes? Could I prepare it and leave it in the freezer for a week without negatively impacting the flavor quality? Oh my word! This is the best oatmeal raisin cookie!! Can’t wait for my husband to get home and try these! Today I made the oatmeal raisin cookies and They were fantastic. I got a little frustrated getting them off the spoon and onto the pan as they are so gooie, but I began dipping my finger tips into a little bowl of water and then working the batter off, it went much better. I tried one pan of cookies in a drop mound shape sort of , and the other pan I flattened the mounds with a spatula. It takes 2 minutes longer to bake when flattened and they are not as good to me as the natural mounded shaped. I baked mine mounded for only 12 minutes, but the flattened ones took 14 minutes to same degree of doneness. Hi Victoria, I like molasses, but I think it might be a little too strong in these. Is it possible to use molasses instead of the maple syrup? Just made these and they are great! I didn’t have applesauce so used coconut oil (instead of the veg oil too). Added flax and a tiny bit of peanut butter just to make the dough a bit more moist. Just made these and added 1/4 cup milled pumpkin seeds and they taste awesome! Thank you for posting this recipe. My husband and I are night-owls and I usually get sweet-tooth cravings around midnight when all the stores supplying vegan stuff are closed. So we went searching online for a vegan cookie recipe that doesn’t use egg or milk replacers and would be good for veg choc-chip cookies. We found this, subbed choc-chips for the raisins and they came out wonderful! I thought they wouldn’t stick together because our mixture came out dry, but when they came out of the oven they were awesome! They weren’t chewy, though, which is good…. I actually don’t like chewy cookies. Absolutely wonderful cookies! I bought a vegan oatmeal raisin cookie at WholeFoods the other day and immediately started looking for its equivalent…and this is it. Making another batch in the morning. Thank you for sharing. Make these gluten free and vegan! I used GF baking flour, coconut oil for veggie oil, used coconut sugar in place of granulated sugar and less than the recommended brown sugar. (they were plenty sweet!) I also added shredded coconut rather than raisins or nuts and added chia seeds and flax. Best cookies I’ve ever had!! Thanks for the recipe!! Thanks for taking the time to post a review. I really do appreciate it. Also (Leah), I’ve used all-purpose flour on occasion and the cookies seem fine. Oh, by the way, I didn’t have whole wheat pastry flour so I just used all purpose. If it affected the cookie, it wasn’t in a bad way! BECAUSE I CAN’T STOP EATING THEM. Hahah but seriously, I made these last night and I think I’ve already had six. I’ve been vegan for a little over a month now, and I love finding baking recipes with common ingredients. They were easy to make and delicious! The first vegan cookies I’ve made that came out nice and chewy. Awesome! You can use whole wheat or all-purpose. For your first batch, I recommend starting with the all-purpose. The key is to weigh it out so that you get 3.25 oz, which matches the amount I use. If you don’t have a scale, stir the flour or sift it, then measure it with a very light hand. The reason is, the whole wheat pastry flour that I usually use is a bit lighter per cup, so if you just packed 3/4 cup of any old flour into your measuring cup, you might pack in a little too much and get dryer cookies. But these cookies are pretty sweet and chewy to begin with, so if you do use too much flour you’ll still get pretty good cookies. Also, this recipe is pretty cheap, so if you mess it up the first time you can go back and do it again with adjustments and not feel too bad about messing up the first. I only have regular whole wheat flour, apf, and unbleached white. I cannot find whole wheat pastry flour. What’s the best sub for a nice chewy cookie? Anna, thank you for sharing this recipe. I’ve made these cookies twice now- a fresh batch cooling as I type (2 never had the chance to cool)- and they came out fantastic each time. Made a few changes as I made these for my little boys: used 1/3 cup agave nectar in place of sugars & maple syrup; 1.5 tbsp flax meal mixed in 4 tbsp water instead of applesauce as I didn’t have any on hand; decreased the flour to 1/2 cup and increased rolled oats to 2 cups. Mixed half the batch with rehydrated cranberries, currants & raisins and the other half with mini semi-sweet choc chips. My boys have food allergies & can’t eat very many treats, but with your recipe they get to enjoy more goodies. Thanks a million. These came out very good. I did not drain the applesauce and I don’t know why that is even in the instructions. I just made these cookies for my friend who is vegan! Best moist oatmeal raisin cookies ever! Thanks! Great cookies! I used all-purpose flour and didn’t drain the apple sauce and they still turned out perfect. I don’t know any other vegans but everyone that tried them loved them. Sorry it took me a while to get back to you. My comment notifications aren’t coming in. The answer to your questions are 1. Yes, quick oats are okay. The cookies will look different and have a different texture, but they’ll work. Don’t use instant, though. 2. The applesauce should be lightly drained. Don’t worry too much about it. Just drain it the best you can to remove some of the water. and 3. Chocolate chips might be okay. I personally wouldn’t use them in this recipe because the cookies are sweet and chewy and raisins go better with it, but you could try adding them if you want. You may want to add a few chips to one small portion of dough just to see how they work. Good luck! This recipe sounds delicious and I can’t wait to bake these cookies tonight! A few quick questions- Will it be alright if I use quick oats instead of rolled oats? How drained should the applesauce be? And will it make a difference if I substitute raisins for chocolate chips (my husband hates raisins)? Thanks! Glad you liked them! The best way to estimate calories is to put a cookie on the scale and say about 120 calories per oz of cookie. So if your cookie weighs 1/2 oz, it’s about 60 calories. I can’t give you the exact amount since cookies vary in size. The scale, however, is a great way to get a rough estimate. I used chocolate covered cranberries. I also used less granulated sugar. My daughters and I loved them. Thanks for the recipe. One of my daughters has an egg allergy so I’m always looking for egg-free recipes. They’re even better the next day. Do you think mashed bananas would work instead of applesauce? Hi! I made these last night, substituting equal parts agave and molasses for the maple sugar and adding 1/8 teaspoon ground cloves and two tablespoons wheat germ. Used a greased cookie sheet. Exceptionally good cookie, and raw would make a nice topping for apples. These were so yummy! I only had about half of the amount of oatmeal so I subbed quinoa flakes. I filled them with vanilla frosting. 🙂 Winner! 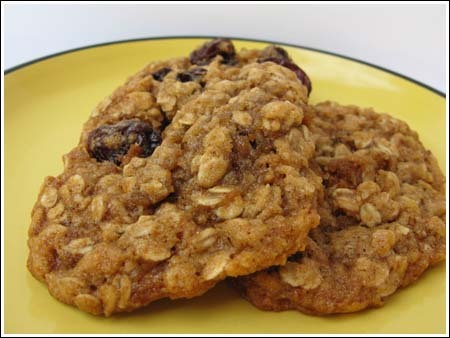 I found this recipe the other day as my kids wanted oatmeal raisin cookies and I had all the ingredients on hand. They said these are the best cookies they have ever had!! Loved the comment Laura! Thanks for the “points of interest”. Hope you had a nice date and that the cookies were great. This may seem silly, but my third date with a gentleman this weekend involves baking cookies. I am LOUSY in the kitchen, so I’ve been practicing different recipes out all day to prepare myself. Just thought you might like to know that THIS is the recipe I’ll be baking tomorrow. Thanks for your helpful guidance. I doubled the recipe, didn’t drain the apple and added a 1/2 c. of milled flax. YUM! I think I will use a bit less sugar next time, just to have less calories, but they are wonderful! KT, thanks for the review! I never thought to add yeast, but that seems like a great idea. Thanks again for posting. WOW these are deff. my favorite oatmeal cookies!! i made some substitutions. i used a touch of yeast instead of soda and it worked just fine! i got it raising in some of the sugar the recipe called for in a touch of water. and i didnt put cinnamon in it. But it was still great! no not great, INCREDIBLE!!! i think i will use less sweetener next time, but thank you sooooooo much!!!!!!! keep on baking! That’s a good point! I hope you like the cookies. Making these now, and besides the fact that I had run out of eggs (we only buy free-range local from the farmer’s market) I had everything else in my pantry which was a pleasant surprise. The other best thing about them is you can eat the batter/dough without fear of salmonella, and it is delicious! Absolutely the best and easiest oatmeal cookies EVER! Made them once with craisins and pecans. Second time with dried cherries, white chocolate chips and mac nuts. Even my non-vegan friends love ’em! Baked them 12 minutes. Perfect. Thanks Anna for making look like a great baker! Thanks for the report, George! If you get a chance, try them with the applesauce. I think it does add a little flavor. They’re finished. The consistency is fine – they came out sort of fluffy. The taste is a little bland. I think they would be better if I had used the varied sweeteners as you suggested. Overall I would say it as a success though. Instead of the applesauce I used 0.4 cups of oil. I don’t think the outcome was especially sensitive to the amount of oil though. I may have used too much. Well they’re in the oven now! I did some other tweaks… all the sugary substances are replaced with brown sugar, and I used more flour and oats. I am also cooking at very high altitude (7000 ft). So all bets are off. I’ll tell you how they turn out in about 10 minutes. George, as I said in the email I just sent you regarding this question, the applesauce is not necessarily a fat replacer in this case. If you end up using oil instead of applesauce, let us know how it goes. However, in this case the applesauce is there to add bulk, flavor and moisture. Looks good. I’m about to try it. Just wondering if the applesauce is there to replace oil so it’s low fat? I don’t have any applesauce but I like my oil, yum. I am currently leaving in Japan so as a vegan in Japan with no oven and no access to vegan butter, I need a recipe that will work with chances to cooking styles and that does not call for butter (or can use coconut oil instead). Needless to say this is prefect. However, I would like to point out that to most vegans, honey is vegan. It is not an over processed product and is naturally taken from the bees, they are not put through a extrenous working conditions, most places (you can research them) will simply build the hives for bees to live in and then take the cultivated honey. There is too much processed honey for the use of the hive. This is a highly debatable concept among vegans, however most side on the “it`s okay” coin. I would simply ask the vegan you are cooking for if they care about honey. Many vegan products are actually made with it. The point of veganism is to be eco friendly and care for the treatment of aniamls. While I try not to have honey, I am not advisered to it. I rather someone use it than grab the wrong kind of suger: bleched sugar/flour, which is bad so my crushed animal bones. Also be cautions, I know you think honey is healthier but it`s probably not. Grade A maple suyrpu is actually more pure and less processed. If you do a cleanse honey is the first sweetener they advise you to stay away from! Maybe try with with grade A maple Syp. just use less, as it is VERY sweet. I have never baked in the past. I am just a fan of oatmeal cookies but my wife was not too keen on trying vegan recipes online until I found this. I tried it with her help and the cookies turned out to be simply awesome. Jodi, I’m so happy you liked the cookies. Thanks for the tip about the honey. Honey isn’t vegan, but it’s a good natural sweetener and probably adds a lot of great flavor. one last thing, i substituted honey for the sugars and it was awesome!!! just a half a cup of honey instead of both of the sugars listed, and they are just awesome. Oh my goodness! These were delicious! I brought them into school for a history class party, and nobody even knew they were vegan. I plan on taking out the cinnamon, oats and raisins and trying the batter for chocolate chip cookies. thank you thank you thank you for this wonderful discovery. These are DELICIOUS! Chewy, moist, oatmealy and sweet. I added chocolate chips and chopped dried apricots – heightened the chewy/sweet elements. Thank you for sharing tasty vegan recipes – always like to be able to share my cookies with vegan friends. *batter = dough. or perhaps, given the circumstances — d’oh! These came out wonderfully, despite the substitutions I made! I didn’t have enough brown sugar, so I used 1/4 cup brown and 1/2 cup white. Instead of maple syrup, I used agave nectar/syrup, and I also threw in about a teaspoon of molasses for added…chewiness, I guess. Also because I like molasses. And I added in a whole lot more cinnamon because I loooove cinnamon. I didn’t plump the raisins, nor did I let the batter sit for ten minutes (was in a bit of a rush). Still came out fabulously! Thank you, I love a recipe that can withstand changes like that. Totally satisfied my oatmeal cookie craving! I made these and they were wonderful! I added some sunflower seeds, and used honey instead of the maple syrup. I will be making these again, maybe with a few more nuts and seeds added. I’ll be trying with less sugar as well, so I can eat more without guilt! Anna, I just wanted to tell you I made these last night with the intention of bringing them in to the office (our admin assistant is vegan and never gets to participate when people have baked goods around here). When I told my husband I was makign these, he said, “Do you HAVE to make them vegan?” Well, let me tell you – he ate 8 cookies last night. He NEVER eats more than one or two cookies at a time. Ever. And then he begged me to let him have the rest of the batch and just make more another time instead of taking them in to work. I split the dough in half and added chocolate chips (bittersweet Ghirardelli ones) to one half for non-vegans and then just made the others as plain oatmeal. I didn’t put raisins in mine, either, because i am weird about raisins (I like them plain but not in baked goods). Both batches were delicious – Rob likes the chocolate chip ones best and I like the plain oatmeal best. for sure i am the latest commer, but trying vagan is a whole new experience, because i am a vegetarian always looking for new treats.And those cookies makes me want to bake all day. Nope! You are not late to the party. Thanks for trying this recipe. Since it was kind of an experiment, I really appreciate your feedback. I liked the cookies too. I might try making my next batch with 1/3 cup brown sugar just to reduce some of the sweetness. However, I don’t want to lose the good chewiness. I know I am late to the party but wanted to let you know I tried these and they were good! My two-year-old son (allergy boy) liked them too. I liked that they were chewy. I made one sub- honey for the maple syrup. Thanks Anna. Anna, how important is draining the applesauce and how long is the process? As I am becoming “as vegan as I can” and learning vegan baking, I would like to try these this weekend. I think I will use cranberries instead of raisins…btw, do you have the Joy of Vegan Baking? The cookies look wonderful – so healthy. I’ll have to try. Fuzz is better this morning! In fact, she was better the moment we got home. I think she just drank too much, too fast. Today’s cookie is going to be a bit late. I have some errands to run. Lizzie’s started crying at night so I think I am going to go purchase one of those dog pheromone plug-ins…Comfort Zone. Hopefully it will help. How is Fuzz feeling this morning? Good thing that Fuzz was better in the afternoon, hope she’s back in the day camp. I could never find whole wheat pastry flour here, so I would have to do them with regular whole wheat or maybe a mixture. By the way Anna, the other day I found here on your site a link to ochef.com, and it is great, really good explanations on flours and other stuff! So thanks for that! This type of cookie would be up there in my top 5 for sure. They look amazing and since oatmeal is high in fibre and raisins high in potassium – hmmm…so healthy I need to make them. How’s that for rationization? They look low fat and worthy to try for me! 😉 I’ve been cleaning all day, the only thing I’ve done in the kitchen is clean it. ;( Those brownies you made yesterday are calling my name! I would make today’s oatmeal ones, but still have LOTS of the tahini ones from yesterday. I’ll freeze them!